Third baseman Juan Silverio of Reds affiliate Bakersfield is this week’s California League Player of the Week. He hit .480 (12 for 25) with two doubles, three home runs, eight RBI and six runs scored. The 22-year-old infielder is on an eight-game hitting streak during which he’s lifted his season batting average 20 points to .290. 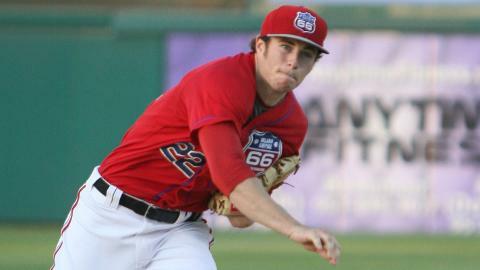 Pitcher of the Week honors went to Modesto’s Jonathan Gray. The former first-round draft pick by the Rockies went five scoreless innings in his only outing of the week, giving up just two its and striking out seven. The California League All-Star team that will take on one from the Carolina League on June 18 in San Jose has been announced. Both local teams are represented. 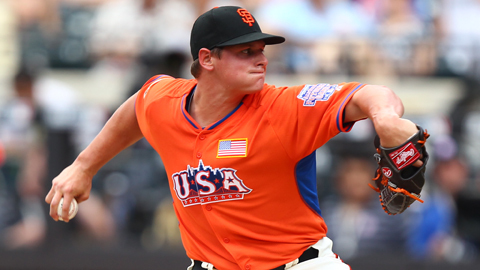 Jake Barrett, Visalia Rawhide; Ty Blach, San Jose Giants; Carlos Contreras, Bakersfield Blaze; Edwin Escobar, San Jose Giants; Drew Grenier, Stockton Ports; Chris Jensen, Modesto Nuts; *El’Hajj Muhammed, Bakersfield Blaze; Josh Osich, San Jose Giants; Brady Rodgers, Lancaster JetHawks; Mark Sappington, Inland Empire 66ers; *Hunter Strickland, San Jose Giants; Dan Winkler, Modesto Nuts. Jeff Arnold, San Jose Giants; Robert Kral, Lake Elsinore Storm. *Ryan Cavan, San Jose Giants; *JiMan Choi, High Desert Mavericks; Matt Duffy, Lancaster JetHawks; *Jake Lamb, Visalia Rawhide; Geson Montilla, Visalia Rawhide; *Ryan Mount, Rancho Cucamonga Quakes; Max Muncey, Stockton Ports; *Cory Spangenberg, Lake Elsinore Storm; Chris Taylor, High Desert Mavericks; Angela Villalona, San Jose Giants; Alex Yarbrough, Inland Empire 66ers. Andrew Aplin, Lancaster JetHawks; Jabari Blash, High Desert Mavericks; Zach Borenstein, Inland Empire 66ers; Noel Cuevas, Rancho Cucamonga Quakes;Preston Tucker, Lancaster JetHawks. Andy Skeets, Manager; Mike Couchee, pitching coach; Lipso Nava, hitting coach; Dave Getsoff, trainer; Dustin Brooks, strength and conditioning. MODESTO — The Cal League improved to 7-6 with two ties in the series by taking down the Carolina League 6-1 before 5,082 fans at John Thurman Field on Tuesday. It was the third straight win by the Cal League. It was the most runs and largest margin of victory since the Cal League’s 10-5 win in 2007. Quakes LF Angelo Songco: 0 for 1 with a sacrifice fly to deep center in the Cal League’s 4-run third. Quakes C Gorman Erickson: 0-1 with a walk and a run scored in the third inning. Quakes SS Jake Lemmerman: 1 for 3 with a double, a run scored and an RBI. He had one of only two extra-base hits in the game. Made several nice plays in the field, including throwing out a runner at the plate on a relay from Josh Fellhauer in the eighth. He was also charged with the Cal League’s only error . Bakersfield LF Josh Fellhauer (Rancho Cucamonga HS): 1 for 2 and started the play in throwing a runner out at the plate on a double in the eighth.